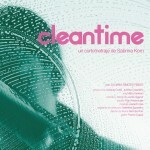 “Cleantime” tells the story of Cristina´s life and routine, a girl who works as a cleaning lady in a gym and enjoys each moment of her day. “Cleantime” es la historia de la rutina de Cristina, una chica que trabaja limpiando en un gimnasio y no se priva de disfrutar de los momentos de su día. Cristina lives with her daughter and her husband in a small house, in the suburbs of the city of Buenos Aires. With her husband they live a distanced life, she works during daytime and he does the night shift. They come across only in the morning and maintain almost no relationship. There is lack of words in their bond. Silences and distances depict a profound emotional gap between them. Cristina wakes up very early, gets on the bike, and faces her day while he´s returning from his night shift far away. He arrives tired, wishing to lie down in bed and sleep. During daytime, she works as a cleaning lady in a fitness center, surrounded by sweaty bodies that practice sports and try to look better. Rhythms, moves, loud sounds and mechanical steps occur while she cleans with dedication and detail, making things look brighter. Although Cristina is invisible to them, she somehow learns how to abstract from that world. Maybe, seen from outside, this is not a desired way of life. But from inside, this woman knows how to live her life, giving herself the freedom to enjoy small things such as staying a bit longer under the sun during her lunchtime. The day the story takes place, Cristina will find a break to the repetition and confinement of work and routine. 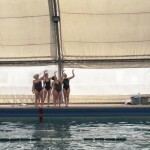 This film tells the story of how beautiful and alienating a routine can be. Between dawn´s orange ray of light and the strange world of work, it is possible to find some air. Finding happiness in a day which is identical to the other, the ways we improvise to have a good time. There is no tedious context that can be an excuse for enjoying the moments of the day. Cristina vive junto a su hija y su marido en una casa humilde del Conurbano Bonaerense. Con él están distanciados, ella trabaja de día y él de noche. Se cruzan sólo por la mañana y casi no tienen vínculo. Hay falta de palabras entre ellos. Los silencios y las distancias, parecen delatar un desencuentro emocional profundo. Cristina se levanta muy temprano, se sube a la bicicleta y enfrenta su día, y él está recién volviendo de hacer su turno lejos. Llega cansado, con ganas de desplomarse en la cama y dormir. En las horas diurnas, ella trabaja limpiando en un gimnasio, rodeada de cuerpos transpirados que hacen deporte y buscan verse mejor. Ritmos, movimientos, sonidos exaltados y pasos maquinales se suceden mientras ella limpia con detalle y cuidado, hace que las cosas tengan brillo. Aunque Cristina pueda ser invisible para ellos y no la registren, ella aprende a abstraerse y a alienarse de ese mundo. Quizás desde afuera y a simple vista no es una vida que se anhela. Desde adentro quien la vive sabe gozarla, tan sólo tomando un ratito de sol en su hora de almuerzo. El día en el que esta historia transcurre Cristina más que nunca, va a encontrar un respiro a la repetición y el encierro del trabajo y la rutina. Esta historia es un retrato de lo hermosa y alienante que puede llegar a ser una rutina. Entre el rayo de sol naranja de la madrugada y el mundo extraño del trabajo, uno encuentra frescura. La felicidad dentro de un día igual a los demás, las formas que improvisamos para pasarla bien. No hay contexto tedioso que sirva de excusa para disfrutar de los días. 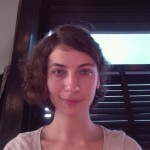 Sabrina Korn studied filmmaking at the “Universidad del Cine” between 2002 and 2007. In 2007 she co-directed “Tenebrous storm, the flower of my age” with Carmen Villaverde. This short film was part of the festival “Women and the film” that was organized by INCAA (National Institute for film and visual arts) and exhibited in MALBA (Museo de Arte Latinoamericano de Buenos Aires). Also, it was part of the “San Luis Film Festival” in 2007 and the “Guanajuato Film festival” in 2010. In 2012, she was selected to be part of the group of filmmakers and artists that integrated the “Laboratorio de cine” which took place at the UTDT (Universidad Torcuato Di Tella) and was dictated by Martin Rejtman and Andrés Di Tella. That same year, she directed “Dirty Sam”, a short film that was shown on the national TV channel INCAA TV during 2013. Since 2011, she works as an assistant director in commercials and film. She is currently writing the script of her first documentary “El Sargento” (The Sargent). Sabrina Korn estudió cine en la Universidad del Cine entre 2002 y 2007. En el 2007 co-dirigió “Tenebrosa borrasca la flor de mi edad” junto a Carmen Villaverde. El cortometraje fue seleccionado para participar del concurso “La mujer y el cine” organizado por el INCAA, y exhibido en el MALBA. También participó del “Festival internacional de cine de San Luis” en su edición del 2007 y en el “Guanajuato Film Festival” en 2010. En el 2012 fue seleccionada para integrar el grupo de cineatas y artistas del “Laboratorio de Cine” de la UTDT (Universidad Torcuato Di Tella), dictado por Martín Rejtman y Andrés Di Tella. En el mismo año, dirigió “Dirty Sam”, un cortometraje que fue exhibido por el canal de televisión INCAA TV durante el 2013, 2014 y 2017. Desde el 2011 trabaja como asistente de dirección en publicidad y en cine. Actualmente, se encuentra desarrollando el guión de su próximo largometraje documental “El Sargento”. Cristina´s world is not a sad world. The joy with which Cristina lives her life is what caught my eye about this character. I was attracted to watching her in an alienating context, without being alienated. Enjoying in the unusual world of the fitness center. I liked watching her find joy and pleasure in her routine, even giving herself the permission to fall in love. Cristina is curious about her freedom and knows no limits, she explores it. In regards to the aesthetic proposal, there is something naturally choreographic in the movement of many bodies together, in the diversity of the collective movement. Each hand, each foot, each gesture, everything is particular to each other. And everything is communicating something. The sum of those singular movements is what we can call “the group”. At the beginning, there was this character who circulates through a rhythmic world, but in a way, she was an outsider. Outsider and insider. I really liked that contrast between the inner feeling and what is happening outside. How the external movement filtrates through us, how permeable we are to the outer movement. El mundo de Cristina no es un mundo triste. La alegría con la que Cristina vive sus días es lo que me atrajo del personaje. Me atrapó verla en un contexto alienante, sin estar alienada. Disfrutar en el insólito mundo del gimnasio, encontrando goce e incluso enamorándose. Cristina es curiosa de su libertad. Y no se pone límites, la explora. Con respecto a la propuesta estética, hay algo naturalmente coreográfico en el movimiento conjunto de muchos cuerpos, en la diversidad del movimiento colectivo. Cada mano, cada pie, cada gesto, todo es propio. Y todo comunica. La suma de esos movimientos singulares es una unidad que podríamos llamar “el grupo”. En un primer momento apareció el personaje ajeno que circulaba por este mundo rítmico, pero de alguna forma estaba afuera. Se puede decir afuera y adentro. Me gustaba ese contraste entre la sensación interna y el exterior. Cómo se nos puede filtrar el movimiento, cómo somos permeables a lo que nos rodea y no tanto.